The Belarusian authorities trade the national identity of Belarusians in exchange for economic subsidies from Russia. Constitutional guarantees of equal rights of the two official languages actually do not work. The majority of Belarusians react indifferently to that fact, as they do in most situations. But the civil society resists russification and tries to prove that Belarusian people have the right for their own identity and language. After the collapse of USSR, Belarus established Belarusian language as the only official language, though most of population still used Russian. Shortly after his election in 1994, Aliaksandr Lukashenka started russification policy. In 1995, he initiated a referendum widely criticised as fraudulent which made Russian the second official language in Belarus. But in fact Russian has become the only official language despite continuous attempts of the Belarusian civil society to revive it. Since then, Belarusian language went through a major decline. Although the Constitution declares equal status of both languages, de facto Russian completely dominates in all spheres of life nowadays. All public bodies provide their services and do paper work in Russian. Law on Languages does not set clear rules on the use of both languages in state documentation, so public organisations and officials simply use Russian. The number of schools with Belarusian language of teaching decreased dramatically and today in many towns Belarusian schools do not exist at all. According to the Society of the Belarusian language, in 2011 around 19% of all schoolchildren in 2011 studies in Bearusian. In Minsk the figure is just 1,5-2% and the proportion is declining. 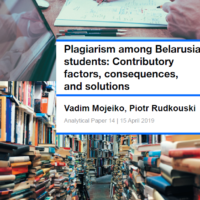 Universities operate mostly in Russian too, though there are some departments where Belarusian dominates, such as Belarusian philology or history. There is not even one fully Belarusian-language university in the country. For common Belarusians, the language has never been a serious issue of concern. Since Soviet times, most Belarusians in urban areas use Russian in daily communication and do not bother themselves with problems of revival of the language of their fathers and grandfathers. Private sector orients on mass demand and therefore also uses primarily Russian language in its services. On the other hand, most topographical signs, like names of the villages, rivers, streets in the cities are written in Belarusian. In public transport, in the capital at least, all announcements are also made in Belarusian. Therefore, there is no genuine bilingualism in Belarus. Russian dominates in most spheres of public communication, and Belarusian has a few very limited domains. The state does nothing to help the language which is struggling to survive. Yet, civil society of Belarus attempts to change the situation and resists russification from the top. Two stories which happened this December good examples of this struggle. Belarusians Must be Russian Patriots? During a press conference on 19 December, Russian ambassador to Belarus Aleksandr Surikov made a speech that caused hot discussions among Belarus intellectuals. “In Russia, we are upset that a part of Belarusian intellectuals do not consider the 1812 war with Napoleon a Patriotic War”, he said. A Patriotic War is a term that was established in Russia for ideological reasons to create a narrative of genuinely mass involvement of Russian people in war with the enemy. Apart from the war with Napoleon, this term is used for World War II in Russia and Belarus since Soviet times. In Belarus, Patriotic War mythology serves an important part of Belarusian official ideology. However, the fathers of the state Belarusian ideology paid little attention to war with Napoleon and the period of Russian empire as a whole. Most Belarusian historians, on the contrary, consider the war of 1812 a civil war for Belarus. Belarusians fought on both sides, Russian and French, but the nobility overwhelmingly supported Napoleon. They hoped to restore Polish-Lithuanian Commonwealth which was divided among European empires in 18th century. Some Belarusian official ideologists share the point of view of Russians, but most historians, including those affiliated with state institutions, reject this as an obviously ideological claim. On 21 December, Belarusian media reported that Minsktrans, Minsk public transport service, decided to change the language in which tickets are printed. 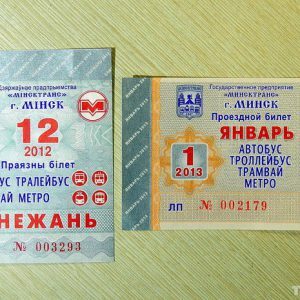 The tickets were always printed in Belarusian, but from January 2013 Minsktrans announced turn to the Russian language. This news travelled fast through social networks and caused a true outrage in Minsk. Immediately, a civil campaign started, that demanded to return Belarusian language on the tickets. People sent letters and called Minsktrans to express their deep concern and urge Minsktrans to cancel the decision. The behaviour of Minsktrans in this situation seemed rather strange. Initially, they stated that the introduction of Russian language was caused by a regulatory act that sets the tariffs on public transport costs. According to this strange logic, the official document was issued in Russian, therefore the tickets must also be in Russian. After the outbreak of attention to the issue, however, the managers changed their mind and claimed that the change of language occurred due to a mistake. The organisation that printed them was blamed for the mistake and one of the officials was even punished. Such fairly different interpretation of the decision uncovers the likely lie of the officials. It seems that there was no mistake in this decision and the authorities simply probed the reaction of citizens to russification initiatives. All cases mentioned here demonstrate two opposite trends. The Belarusian state headed by Lukashenka ignores national values and even encourages russifiction. The current state of affairs in relations with Russia, which has massive leverage on Belarus, presumes no signs of Belarusian nationalism. National values become another item of bargaining for cheap energy, credits, and open markets. Due to these reasons, the government has never come up with any policy to support the Belarusian language. Moreover, it hindered a lot of initiatives to support the language even such initiatives involved no politics. As a result, the Belarusian language practically disappeared from official discourse as well as individual use in recent decade. Within Belarus governing elite, there are no groups that openly support national values. Meanwhile, common Belarusians do not reflect on cultural matters and focus on more materialist problems. In such situation, the active part of civil society serves as the only defender of Belarusian culture and identity. As the cases of Napoleonic War and transport tickets show, Belarus civil society is capable of defending its interests and can even influence the state policy which may at first seem impenetrable. How Pro-Government are Pro-Government Parties in Belarus? Observers of Belarusian politics have lately noticed increased activism of a political party that is traditionally labelled as pro-governmental. The leader of the Liberal Democratic Party Siarhey Haidukevich and his son and also deputy Aleh Haidukevich have recently featured a lot in the media. For many this again raised the question about the role and status of pro-governmental parties in the Belarusian political system. The analysis of such parties reveals a number of interesting facts. Firstly, the majority of them exist only on paper. Secondly, those few active parties look very different. Not only are their official ideological backgrounds different but they also seem to play different roles. When changes start to take root in Belarus those parties might quickly find themselves in competing political camps. Belarus has 15 officially registered political parties. A number of parties work without an official status. The most noticeable of these is the Belarusian Christian Democrats (BCD). In spite of several attempts by the BCD and others, no new political party has been registered since 2000. The last one to secure registration was the oppositional Conservative and Christian Party – BPF. Under these circumstances some organisations do not even try to become parties even though they obviously have political ambitions: for example, the For Freedom Movement and the non-registered Tell the Truth campaign. Talking about the membership of the parties is a bit problematic. Officially, the Liberal Democratic Party has the biggest number of members – about 45,000. However, how many of them actually contribute to the life of the party and how many can be mobilised for any activities remains unclear. The same problem is characteristic of the other parties: their official membership significantly exceeds their real potential. Observers normally divide the parties in Belarus into two blocks: pro-governmental and oppositional. The table below demonstrates the division. *Political parties that were active in the 2012 parliamentary campaign, according to the OSCE/ODIHR reports. the Communist Party of Belarus (CPB). Unlike the majority of the “paper parties” in the loyal camp, these three stay active in their day-to-day lives. Moreover, being in the same pro-governmental category they are nonetheless very different: from the point of view of their ideologies, positioning strategies and potential for changing the political side. The CPB presents the simplest analytical case. It is the most loyal supporter of President Lukashenka’s policies. Unsurprisingly, it has always had representation in the Parliament, which in the Belarusian political system is an appointed rather than elected body. Following the elections of 23 September 2012 it now has 3 MPs in the House of Representatives – the lower chamber of the Parliament. This looks huge by the existing Belarusian standards: the overall number of party-affiliated MPs in the current convocation of the parliament is only 5. The CPB positions itself as the only decent successor of the Communist Party of the Soviet Union and, therefore, promotes the typical communist propaganda of those days. It harshly criticises private property and the market economy, demonises the West and praises the might of Belarus’s union with Russia. However, as one of the staunchest supporters of the incumbent the CPB can hardly be considered as a pure ideological party. Alexander Lukashenka always acts out of pragmatic interest rather than ideological values. Therefore, a more correct definition for the CPB would be a pocket party behind the brand of Soviet-era communism. Its role in the political system is to create an image of the successive nature of Lukashenka’s regime, which the old generation appreciates. But the CPB will not survive as an influential political force without the administrative backing of the regime. With the RPLJ, things gets more complicated. On the one hand, this party only rarely features in the media and generally keeps a low profile. An ordinary citizen will hardly recognise its name. On the other hand, the RPLJ managed to mobilise the second largest number of observers among the political parties in the latest parliamentary election (after the CPB). The party’s stance towards the government is also contradictory. While it never publicly criticises the authorities, in private conversations and talks with foreign partners the leaders of the party speak quite negatively of the regime. They say that the government’s policies will finally lead to a social and economic tragedy in the country. Interestingly, after the latest election the RPLJ got one mandate in the parliament. 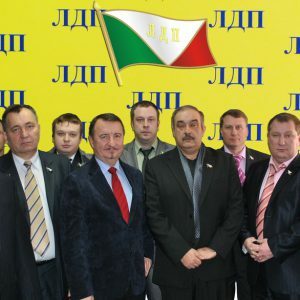 According to the party’s chairman, Vasil Zadniaprany, the authorities had to react to the RPLJ’s growing influence in the regions by providing it with a seat. But this explanation sounds unconvincing. The Belarusian authorities normally react to someone’s increasing popularity and power by repression, not support. So a different version looks more realistic. The leader of another pro-governmental party stated in an interview with the author that the RPLJ was created in the mid-1990s by the Security Council of Belarus as an instrument to control the centre-left political segment. As a social-democratic party the RPLJ really suited such a role. But after Lukashenka’s regime became consolidated at the beginning of the 2000s it no longer needed the RPLJ and the party appeared on the margins of the political life. It is unclear why the regime decided to grant the RPLJ a parliamentary seat this time. Possibly, it was a part of the game with the West: to create at least some impression of the existence of a loyal opposition. Generally, it seems that, unlike the CPB, the RPLJ will be quite prone to becoming a government opponent as soon as some political liberalisation begins. The LDP presents the most interesting case among all the parties. Its motivation, activities and sources of financing have always caused numerous speculations. In many respects it looks like a clone of the Liberal Democratic Party of Russia that is chaired by Vladimir Zhyrinovsky. They both only remotely resemble classical liberal democratic parties. Their ideologies are vague and political decisions are often made on a case-by-case basis. Moreover, they both have charismatic leaders whom many see more like showmen rather than serious politicians. The LDP has been quite critical of the government. In 2001 and 2006 its leader Siarhey Haidukevich even competed with Lukashenka for the presidency (many considered him as a sparring partner, though). The party obviously tried to project an image of constructive opposition. However, the LDP always supported the regime on critical issues. For example, in 2004 the party’s leader made a public statement in favour of lifting the two terms presidential limit for Lukashenka. And in 2012 the LDP actively joined the authorities in their anti-boycott campaign. In recent months the party has become particularly active. Its leaders regularly appear in the media, both government-owned and independent. According to their statements, the LDP has started preparations for the 2015 presidential race in which Mr Haidukevich stands unprecedented chances of winning. The latter seems doubtful. But it is clear that the LDP will become increasingly oppositional as the government’s grip on power lessens. Thus, today the pro-government parties quietly act within the limits that the government allows them to. Apart from the LDP, they mostly stay unnoticed by the general public. But depending on what happens in Belarus, we can expect differing strategies from different political parties not only in the opposition but also in the pro-governmental camp. Some of them will continue to perform their current roles of loyal supporters or critics while others will move to the other side of the political spectrum. We might all see completely new parties with the same old names. And this will be an exciting show.